A number of federal agencies are responsible for carbon cycle research; together, they have planned and are coordinating a multidisciplinary research strategy to integrate the broad range of needed infrastructure and resources, scientific expertise, and stakeholder input essential for program success and improved decision processes. This coordination is achieved through the Carbon Cycle Interagency Working Group (CCIWG), which is responsible for the programs, funds, development, coordination, and integration of carbon cycle research across the federal government. The Carbon Cycle Scientific Steering Group (CCSSG), a panel of experts who are actively engaged in various aspects of carbon cycle science, provides the U.S. Carbon Cycle Science Program with continuous individual scientific input. The U.S. 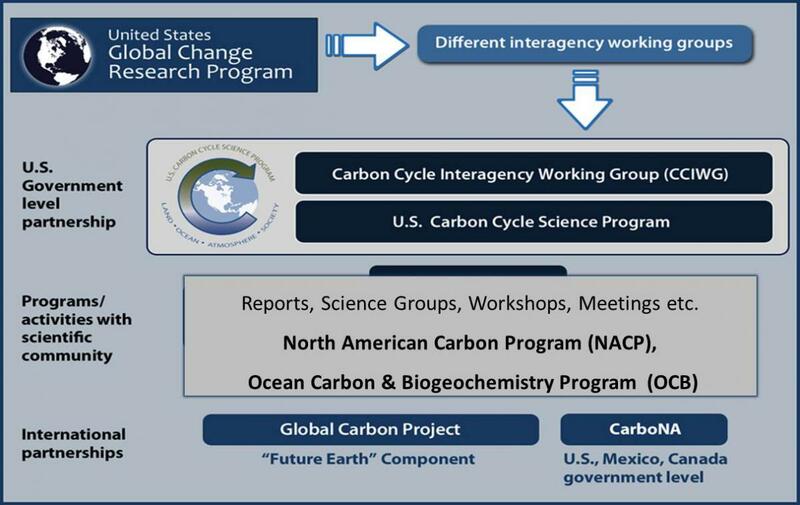 Carbon Cycle Science Program consists of three major activities: the North American Carbon Program, the Ocean Carbon and Biogeochemistry Program, and International Activities. The Program has sought to better understand past changes and current trends in atmospheric carbon dioxide and methane, deliver credible predictions of future atmospheric carbon dioxide and methane levels, and strengthen the scientific foundation for management decisions in numerous areas of public interest related to carbon and climate change in the U.S. and other regions. Currently, 12 U.S. government agencies and departments lead, constitute and support the U.S. Carbon Cycle Science Program through the CCIWG which is the longest surviving formal interagency working group functioning under the aegis of the U.S. Global Change Research Program (USGCRP). This interagency partnership has been providing a coordinated & focused scientific strategy for conducting federal carbon cycle research within and beyond the United States in accordance to the 1990 U.S. Global Change Research Act (GCRA, P.L. 101-606) for more than a decade. The GCRA mandates improved cooperation among federal agencies and departments with respect to global change research activities. Evolving from a predecessor non-USGCRP interagency group 'the Terrestrial Ecology and Global Change (TECO) research program' in the 1990s, the CCIWG was formally constituted as a working group the USGCRP in 1998, in parallel with the development of the 1999 community plan for U.S. carbon cycle science (Sarmiento, Wofsy et al. 1999) described in the section below. Pre-2009, the U.S. Carbon Cycle Science Program addressed the global carbon cycle research theme in the Strategic Plan for the U.S. Climate Change Science Program (2003), formerly and currently known as the USGCRP. In 2007, the Climate Change Science Program released a major report from the Carbon Cycle Science Program - the State of the Carbon Cycle Report (SOCCR, also known as CCSP Synthesis and Assessment Report 2.2). After regaining its current name in 2009, the USGCRP produced its newest decadal plan in 2012 (US Global Change Research Program, 2012). The U.S. Carbon Cycle Science Program and the CCIWG remain historical interagency activities under the auspices of the USGCRP aligned with its new vision and mission, specifically within Program Element 2 (Multidisciplinary Earth and Human Understanding) under Goal 1 (Advance Science) of the 2012-2021 USGCRP Strategic Plan. The Carbon Cycle Science Planning documents are non-federal reports developed and published by the community to provide U.S. funding agencies with information on long-term community-based research priorities for carbon cycle science. The U.S. Carbon Cycle Science Program and CCIWG develop and implement research and funding priorities based on such community feedback in allignment with the USGCRP Strategic Plan and the evolving near- and long-term research priorities of the USGCRP. An earlier report, A U.S. Carbon Cycle Science Plan (1999) (Sarmiento and Wofsy, 1999), reflects the combined knowledge and insight of prominent carbon cyclescientists and well-informed science program managers in both academia and federal government. The vision is that an integrated interdisciplinary science, multi-agency partnership, new and advanced technology and advanced modeling approaches would yield better understanding of the carbon storage, sources and sinks in North America and adjacent ocean basins, and that the research would strengthen the scientific foundation for resource management and policy decisions in numerous areas of public in numerous areas of public interest. The publication of A U.S. Carbon Cycle Science Plan (2011) (Michalak A., Jackson R., Marland G. and Sabine C., co-chairs) resulted from a new planning effort to update and revise the 1999 plan. The Carbon Cycle Science Program Office, established by the CCIWG, assists in leading the Carbon Cycle Science Program and facilitates interagency cooperation in carbon cycle research through coordination of interagency business (e.g., policy, budget, personnel, strategic direction, work planning, and education). The Program Office staff are responsible for providing direct support to the CCIWG co-chairpersons in matters associated with interagency activities, such as annual budget planning, fiscal matters, inventory of funded projects, and planning meetings and workshops. The Program Office Staff also represent the CCIWG on carbon cycle science issues with the USGCRP, and liaise with international carbon cycle science programs and organizations. The Staff supports the CCIWG in preparing, reviewing, and coordinating any reports or other documents as required; analyzing the scope and content of funded carbon cycle research projects and informing the CCIWG on project status, needs, and opportunities for enhancing research and coordination among research scientists and agencies; and communicating significant new findings to decision makers and the public. Currently, the Program Office is led by its Director, Gyami Shrestha Ph.D.